I hold my hands up: I've been a bit rubbish with blogging during these last six months. A new job to get to grips with and a few other things going on in my life kind of got in the way. But balance has finally been regained! So, one of this year's resolutions is to hunt out some interesting new projects and get back out there with my camera... I've already started with a couple of photo walks, the latest shots from which you can see here. Yesterday I hit on the idea below, via Sarah, one of my favourite bloggers down under at www.abeachcottage.com. These Antipodean gals are keeping me sane at the moment with their sunny summer shots and stories from down under (actually Sarah's a Londoner turned Ozzie, so that's kinda nice). Remember back in 2010 I did my 365 Project? 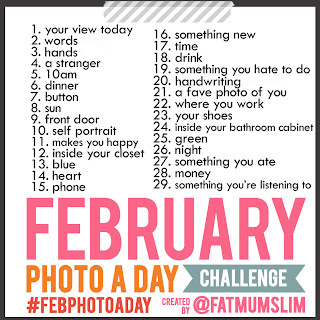 This is a scaled down version lasting a month, but using prompts for each day. I like the extra challenge of finding a subject which fits the prompt and comparing other people's interpretations of it. It's supposed to be Instagram based but I think I'm going to be flexible on that and use a range of different cameras: DSLR, Compact and iPhone. There was a January version, but I think I've missed the boat now for that one! Let's see how I get on! Welcome back and sounds like a cool idea, cheers for the linkeroo too. Hope the job's goin' ok! Oh, and your twitter bird keeps getting in the way! Oh that's a neat idea! I was going to start a Food 52 project this February, but I don't think I'll be able to keep up. But having a project on hand always keeps you committed and engaged. Good luck with it!